Kimberly Burroughs Debrow is an assistant district attorney in the Anti-Corruption Unit of the DeKalb County District Attorney’s Office where she focuses on the prosecution of fraud, white collar and violation of public trust cases. Prior to joining the DeKalb County DA’s Office, Debrow was chief senior assistant district attorney for Fulton County’s District Attorney Office in its White Collar Crime and Public Integrity Units, and an associate in the Atlanta office of Schiff Hardin LLP where she practiced in the General Litigation Group and on the firm’s National Appellate Team. Prior to law school, Debrow previously worked and held positions at the U.S. Capitol and U.S. Department of Justice, as well as several national non-profit policy organizations in Washington, D.C. Recently recognized as one who is “On the Rise” by the Daily Report, Debrow has developed an expertise in Georgia’s business crimes and forensic financial investigations. 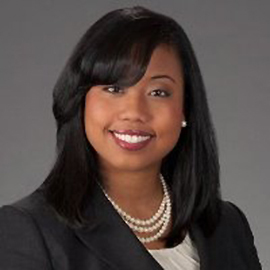 She currently serves on the Consumer Advisory Board for the Office of the Attorney General of Georgia and she is a graduate of LEAD Atlanta and Leadership Georgia.